I don’t do nail art very often, or even… ever, you just need to look back through my ‘nail of the day’ archives to see that. It’s not that I don’t appreciate it, I look longingly on tumblr at all the cool kids and their striping brushes but the problem is that I’ve got an essential familial tremor. It’s genetic – you can hear my Dad carrying a tea tray from the other side of town. Because I’m still (fairly) young, you’d be hard pushed to notice it in everyday tasks but when it comes to something that takes skill, precision and a delicate touch… I get the shakey jakes and the more I concentrate, the worse it gets. Which is why, I’m pretty damn impressed with my attempt at some Valentine’s themed nail art. It’s not massively complicated and thank God for being able to play dot-to-dot with a dotting tool BUT, it took me about 3 hours to finish (stop laughing), and I feel like ronseal-ing it to my nail beds to last for all eternity. Dudes, I even tried to magnetize the hearts. Dedication. Not that it worked very well. I’m not sure who else is taking part in the challenge (Sophy Robson’s blogging twin knowing my luck) but the participants stand a chance at winning a £150 John Lewis voucher so I am totally trying to bring my a-game! Good luck to my fellow nail art(istes) taking part and cheers to John Lewis (and the makeup and beauty team) for the polishes and the opportunity to play along. Do you ‘do’ nail art? Who are your biggest sources of inspiration? haha, I can see the cogs turning! 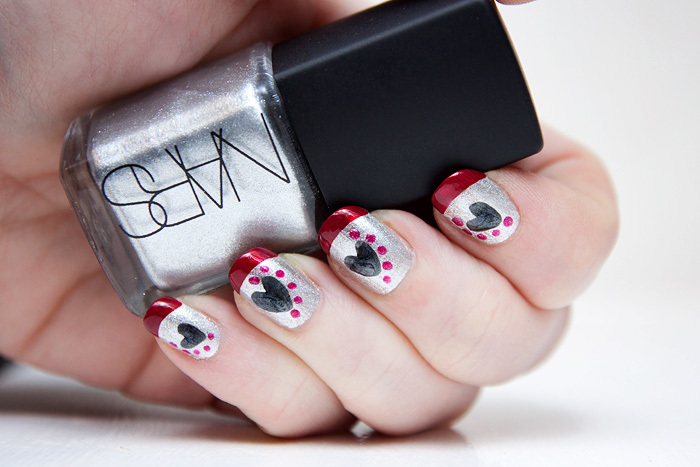 I used a striping brush for the hearts – it’s hilarious how ‘thick’ the polish became with the to-ing and fro-ing trying to get them to look neat! The tips were freehand! I always roll my fingers rather than move the brush, it almost creates an upside-down “v” shape – then I try and gently smooth out the v into more of a semi-circle. Cheers! This is so cute! I rarely do nail art. I do use magnetic polish, which I have been known to call “nail art for dummies.” And I’ve unsuccessfully tries stamping several times. My crowning achievement is doing the newspaper trick, which is really quite easy (just google newspaper nails if you don’t know what I’m talking about). Yeah, newspaper nails are brilliant aren’t they?! Those are so cute! I love the tips! I think your nails turned out beautifully! I would be delighted to have my nails turn out like this. Are the tips done with tape or a striper? They’re so even and nice! Most of my nail “art” is a variation on the skittles manicure, where I just use different topcoats or slight variations in colors. Perhaps I’ll try to mimic this with blue instead of red (obviously giving credit if I post it anywhere). 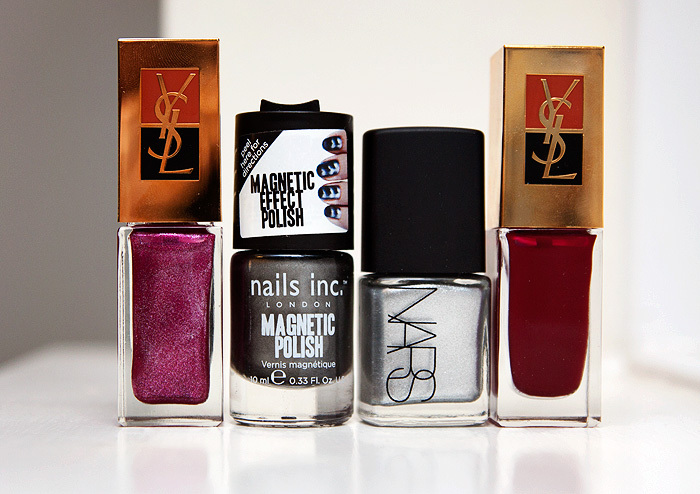 Various beauty blogs are obviously an inspiration and idea sparker to most readers. If I see SIMPLE nail art I sometimes try to do something like it (with different colors or dumbed down). Lately I get inspiration from the weekly “challenges” on Never Too Much Sparkle, a makeup facebook group I’m in. Thanks so much – I just used a normal brush for the tips, though the YSL brush isn’t one of those pro-wide ones. I always roll my fingers rather than move the brush. I kinda work from the edge to the middle, then start the other side which gives a little upside-down V shape. Then I fill in the V. It’s always easier to do smaller tips than you think you need because you inevitably ‘build them up’ whilst trying to make them neater. Does that make sense?! Your nails look cute as a button. not a chance in the world i could achieve something like that. wow!! Honestly, I was SO chuffed with it when I’d finished. Mr. L was just relieved that I could return to being a Mum again. I was proper “keep that child away from my wet nails!” while I was painting. BAD MUMMY. £150 would buy a lot of nail varnishes to practice with too. Good luck. I could have done nwith doing this as I always have good intentions to do a bit of nail art but never seem to be arsed enough to actually do it haha. You did a fab job! It’s like Ready, Steady, Nail Art! Hahah, green peppers or red tomatoes?! I have the same problem!! I’m usually not shaky, but as soon as I try to concentrate on something delicate like nail art (or liquid eyeliner…) I might as well be trying to paint during an earthquake! Any suggestions on how to tame the shakes? You’re nails turned out gorgeous! As well as being awesome (not just for someone who’s not confident doing nail art; they are actually awesome) I love the fact that you did something different by putting the silver down first and using the red and pink for the nail art. u did a great job…i cant really paint my nails properly so i have no hope in a challenge like this….